Mitchelton-Scott's Esteban Chaves has confirmed his return to racing after struggling with health issues in 2018. The Colombian will appear at the Volta a la Comunitat Valenciana in February. 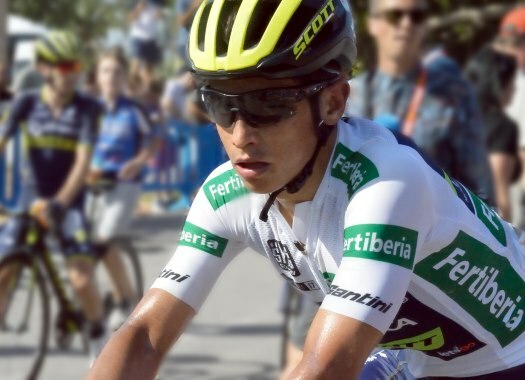 Chaves was diagnosed with the Epstein Barr virus after his performance at the 2018 Giro d'Italia in which he suddenly struggled after a first good week. The rider has been out of competition since the Italian grand tour and will return to it at the Spanish race that is set to be held between the 6th and the 10th of February of 2019. The Colombian also announced the first edition of the Gran Fondo Esteban Chaves, which has been described as a "race of life". The Gran Fondo is a worldwide crowdfunding to raise money to help children to overcome orthopaedic problems that stop them from playing, writing and even walking. Former and current riders like Eddy Merckx, Purito Rodriguez, Mathew Hayman, Paolo Bettini, Mariana Pajón and Annemiek Van Vleuten are involved in the initiative launched by the Esteban Chaves Foundation to raise money for kids in need. Chaves has teamed up with Dr Julio Sandoval, who saved his career after a traumatic racing incident in 2013. "Bike racing has changed my life and now we have the opportunity to use it to change the lives of even more children," said the rider. "In 2013 I was incredibly lucky to come across Dr Sandoval after so many doctors told me my career was over, and now I want to give more smiles to more children, like the one Dr Sandoval gave me."